As of 11:00 PM, Friday night, April 19, severe weather watches and warnings for our neighborhood have been terminated. We did not experience any damaging weather, though a heavy thunderstorm with high winds and heavy rain passed through our neighborhood between about 8:30 PM and 9:10 PM Friday night. According to our neighborhood weather station, during that half-hour, almost 2/3 of an inch or rain fell (0.64 inches) while wind gusts reached only 12-14 MPH. Tornado warnings were issued for the period 8:15 to 9:00 PM, but no tornadoes occurred. The National Weather Service in Wakefield VA has issued a tornado WATCH and flash flood WATCH for our area. TORNADO WATCH in effect until midnight, Friday night, April 19. FLASH FLOOD WATCH in effect until 3:00 PM, Saturday, April 20. 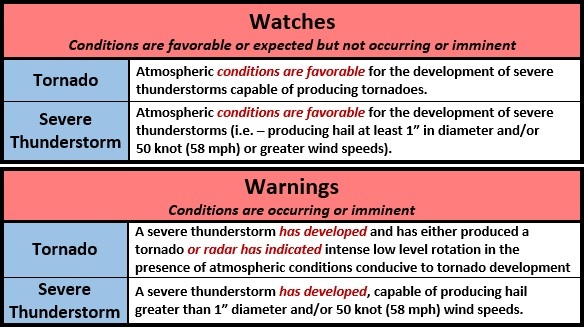 A WATCH means conditions are favorable for the development of severe weather — such as a tornado. A WARNING means that a severe weather event — such as a tornado — has developed, has been spotted on the ground, or, has been spotted on radar. Monitor local radio stations, Richmond TV stations, or your weather radio if you have one. A tornado touched down around 11:00 AM, Friday, April 19, near Smith Mountain Lake, in Franklin County, about 175 miles SW of us. The storm front that spawned this tornado is moving in our direction, expected to arrive in our area late Friday afternoon. Here is a link to weather radar that covers our area. The National Weather Service office in Wakefield VA has released a severe weather alert that only slightly affects our neighborhood on Friday, April 19 into the early hours of Saturday, April 20. Tie down or remove furniture, grills, or anything on your deck or in your lawn that can be blown around. Be prepared to lose electrical power. The Accuweather forecast for our neighborhood calls for possible severe thunderstorms and high wind gusts Friday and Friday night. Good morning. The following is briefing #2 for the Potential Severe Weather and Heavy Rainfall for April 19 2019 as of 830am 4/18/2019. See the attached images for details. The next briefing will be by 4 pm April 18 2019 or sooner if conditions change. There are currently no major changes to this forecast update from yesterday. Note the more detailed timing below. Threats: There is an enhanced risk for severe weather for much of south and southeast Virginia and northeast North Carolina on Friday. Surrounding the enhanced risk is a slight risk for severe weather for the rest of the states of Virginia and North Carolina, and the Maryland Eastern Shore. As low pressure moves up the Appalachians, conditions will become increasingly favorable for severe thunderstorm development across the entire region especially Friday afternoon into Friday night. This includes the potential for damaging winds, large hail and a few tornadoes. In addition, there is a slight risk for excessive rainfall on Friday across much of the region. This means that flash flooding is possible due to heavy rainfall from thunderstorms. Lastly, marine interests should be prepared for possible southerly gale force gusts in excess of 35-40 kt later Friday afternoon into Friday night, especially across the lower Chesapeake Bay and the Atlantic Coastal Waters. See attached graphics for more details. Location: All of central and southeast Virginia, the Virginia and Maryland eastern shore and northeast North Carolina. This includes the Chesapeake Bay and Atlantic Coastal Waters. Nearly the entire area is under a slight risk for excessive rainfall. Timing: There will be an initial round of scattered thunderstorms across the entire region starting late Friday morning and continuing into Friday afternoon. There is a potential for these storms to be strong to severe with wind gusts to 60 mph and large hail. Then, a more organized area of thunderstorms will move through the region late Friday afternoon into Friday night. This area of storms will bring the risk of wind gusts greater than 60 mph, large hail, and even a few tornadoes. · The environment currently looks favorable for a few tornadoes late Friday afternoon into Friday night, especially across southeast Virginia and Northeast North Carolina. People should consider their tornado action plans and what they would do if a tornado warning is issued for your area. · Severe storms could result in areas of 60-80 mph wind gusts Friday into Friday night. This may lead to downed trees and power outages. Large hail is also possible. · Rain will be heavy at times, allowing for the potential for flash flooding. If you live in a flood prone area, have an action plan ready in case flood or flash flood warnings are issued. · Marine interests should be prepared for gale force wind conditions later Friday afternoon into Friday Night as the low approaches. · Details will become better refined as the event comes closer. However, everyone should think about their severe weather safety plans now so they can quickly act if severe weather approaches your location Friday. Here are the maps accompanying the announcement. NOTE THAT WE ARE IN THE MARGINAL to SLIGHT RISK AREA. Our neighborhood is in MARGINAL RISK area for high water. We are in SLIGHT RISK area for severe weather with scattered severe storms possible. According to this map, we can expect high winds with gusts in the 28 – 39 MPH range Friday afternoon and Friday night. Minutes and supporting documents for the April 6, 2019, Special and Annual Meetings are now online. Follow this link to the MINUTES PAGE where you will find these documents. We had a good crowd, met lots of new neighbors. The main order of business — approving a change in the annual meeting date — was approved. Minutes, financial report, water system report and other supporting documents will be posted soon. Board meetings are open to all property owners. If you plan to attend, please RSVP either by email to potomacbaypoa@hotmail.com or contact POA President Dave Williams, 804-580-2095. For more information, RSVP and proxy forms for the annual meeting, go to this article. The purpose of the April 6 meeting is to change our Bylaws to establish March or April as the date for our annual meeting. Section 4.01 Annual Meetings. The annual meeting of the Association, for the purpose of conducting the election of Directors and for the transaction of such business as may properly come before the meeting, shall be held in May or June at the time fixed by the Board of Directors. Section 11.02 By the Members. At any annual or special meeting, the Bylaws may be amended by a two-thirds vote of the members entitled to vote, in person or by proxy, if notice of such amendments has been provided in advance pursuant to section 4.04. Section 4.04 requires such notice to be provided to members at least seven days before the special meeting at which a Bylaws change is to be considered. Section 4.01 Annual Meetings. The annual meeting of the Association, for the purpose of conducting the election of Directors and for the transaction of such business as may properly come before the meeting, shall be held in March or April at the time fixed by the Board of Directors. This communication serves as the notice of (1) a special meeting, and, (2) proposed Bylaws change as required by the PBE POA Bylaws. Upon receipt of this notice, please respond if you will attend the April 6 meeting in person or by proxy. If you will not attend, and wish to be represented by proxy, please download and complete the proxy form found on our website at: RESPONSE FORM AND PROXY FORM for April 6 special meeting Instructions for returning the form are on the form.